A versatile keyboardist, Anne can be found playing jazz piano in the Cleveland club scene, classical piano with several choral groups (including Apollo’s Fire Singers and Cleveland Heights High School choral ensembles) and organ at Forest Hill Church in Cleveland Heights, OH where she is organist and conductor of five choirs (three singing, one handbell, one steel drum). She is Staff Accompanist at CWRU and occasionally plays organ with the Cleveland Orchestra and toured with them on their West Coast and Carnegie Hall tours in 2012. Anne is also the founder/past president of the Greater Cleveland Classical Guitar Society. Anne has won first or second prizes in seven national/international organ competitions and holds the American Guild of Organists’ prestigious Fellowship and Choirmaster certificates. 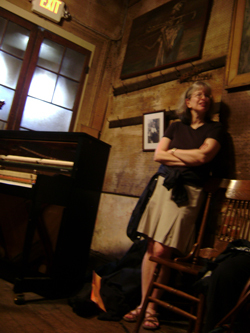 She has presented many recitals and workshops at conventions of the American Guild of Organists, the Organ Historical Society, and the Presbyterian Association of Musicians. She has also been featured on NPR’s “Pipedreams” program and Cleveland radio station WCLV’s Not the Dead, White, Male Composers Hour.